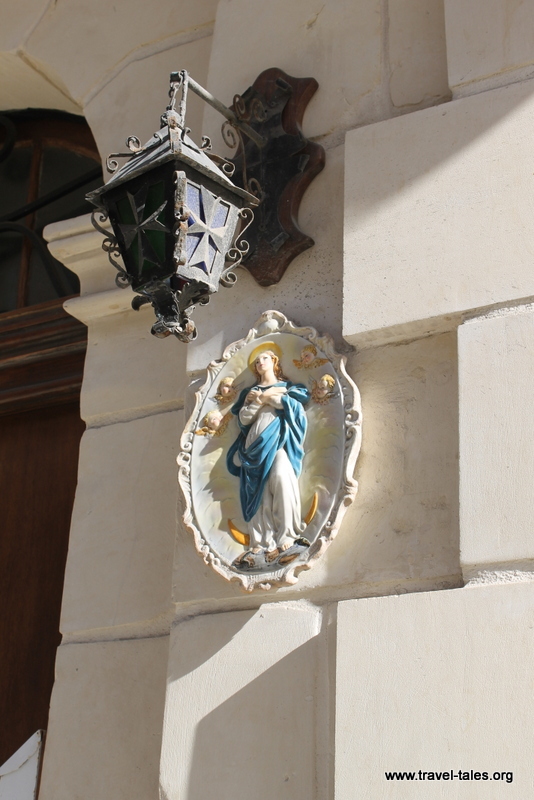 I started noticing images of holy figures beside the doors in Sliema when I was photographing the Gallarijas and how they are held up. Even the door to the utility shed at the beach towards St Julien had one. I assume they are to bless the house, those in it or those passing through the door they are fixed next to. The frequent images of Mary and Jesus (or just one of them) made me more vigilant of other beautification of door frames. This one could take quite a lot of maintenance if the plant wasn’t a succulent which probably survives even if there was some neglect. These tiles seemed a little out of place, however they do brighten the facade of the house they are on. The purpose of the coloured notice on this door is quite clear, I’m less certain of what lurks behind the little door of the other house. It was the only one I saw, so it didn’t strike me as a standard feature for coal delivery or anything of that time.